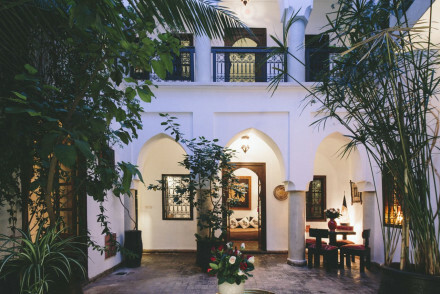 Marrakech has become an ever more popular destination in recent years, and more often than not it's a Marrakech medina hotel or riad that people want to stay in. Marrakech has the advantage – for northern Europeans at least – of being a) just four hours flying away, so reachable by the low cost airlines like Ryanair and Easyjet, and b) exotic. It's the Marrakech Medina, above all, that gives it it's exoticism. Medina is an ancient Aramaic word meaning city, and in Marrakech it simply denotes the oldest part of town. It's a warren of small winding alleys, souks (marketplaces) and squares, with shops, houses, mosques and hammams crowded cheek-by-jowl in a space little larger than Soho in Central London. So if you want to have an authentic experience when holidaying in Marrakech, in the most atmospheric part of the city, a hotel or guesthouse in the Marrakech Medina is the best place to stay. Staying in the Marrakech Medina? Beware fake reviews! However, before choosing one – and we list our favourites below – you should bear in mind that these hotels and guesthouses – called riads or riyads in Morocco – differ from regular hotels in a few important respects. First, they are often hidden down dark back alleys, where the lighting is often not the best, so for nervous travellers they may seem daunting. Second, they are all in converted old buildings, so the construction will be traditional, the electrics and facilities not up to the standard of western hotels, and the fittings not as slick. There are also over 1000 converted riads in Marrakech, not all of them licensed. 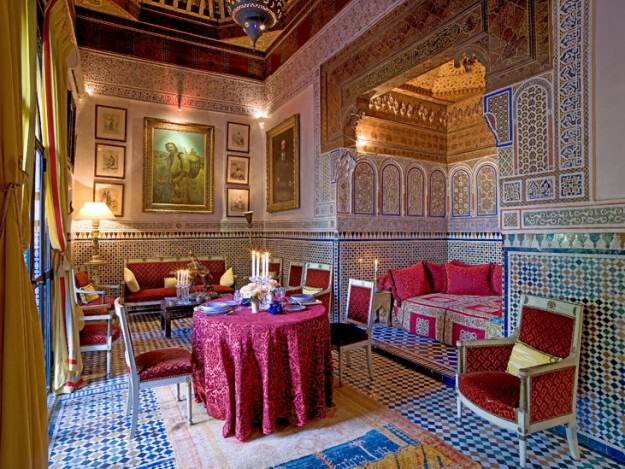 This, perhaps is the most important point – you need to choose a reputable riad if staying in the Marrakech Medina, because being in such old buildings, it's doubly important that fire regulations and safety aspects have been adhered to. With the boom in tourism to Marrakech it's become all too easy for unscrupulous landlords to turn their old houses into riads, converting them cheaply, with no regard for regulation. And don't just rely on Trip Advisor – the cleverest riad owners know how to game the system, with multiple faked reviews pushing their riads to the top. If all of this seems challenging, there are plenty of four and five star hotels with all the mod cons in the New Town, just outside the medina. 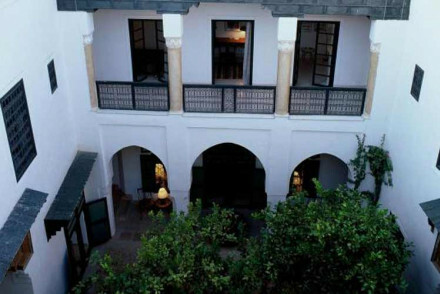 You can stay in comfort, and explore the old town and souks by day. 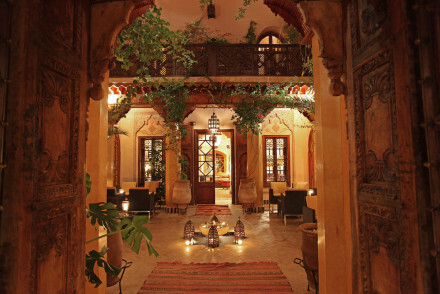 But if you want atmosphere, head for one of our recommended riads in Marrakech medina. In the heat of summer, Marrakech Medina comes into it's own, with it's cool, dark alleys, shaded courtyards and tinkling fountains. However, the riads can still be hot, so you may want to choose one with air-conditioning. 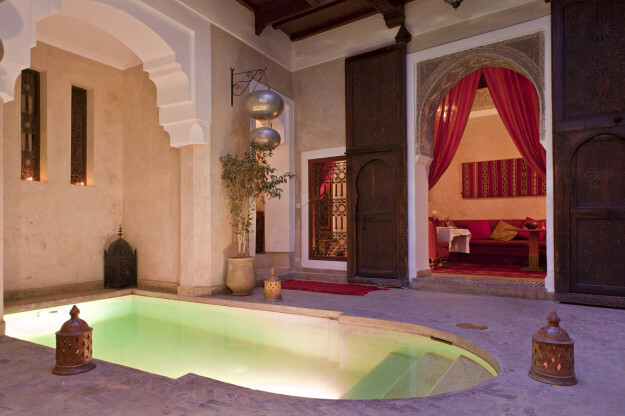 Also a swimming pool – though in these riads, because of the lack of space, these are generally little larger than plunge pools. 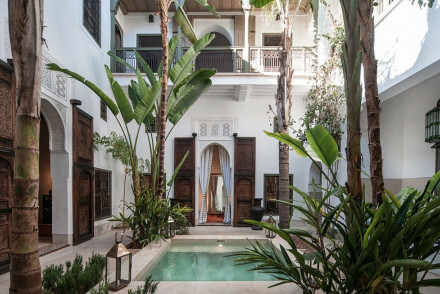 Riad Jaaneman offers a lovely courtyard plunge pool, surrounded by lush tropical plants, or for one with a larger than average offering the Riad Sapphire is a good option. 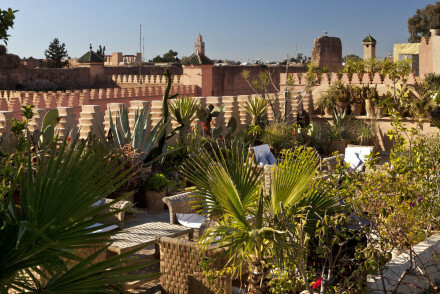 There are numerous delights about staying in Marrakech, but one of the most special is being able to sit outside and gaze across the rooftops as the muezzin call to prayer or the storks settle on the chimney pots, as you sip your orange juice (freshly squeezed) or sweet hot moroccan tea and plan your excursions for the day. 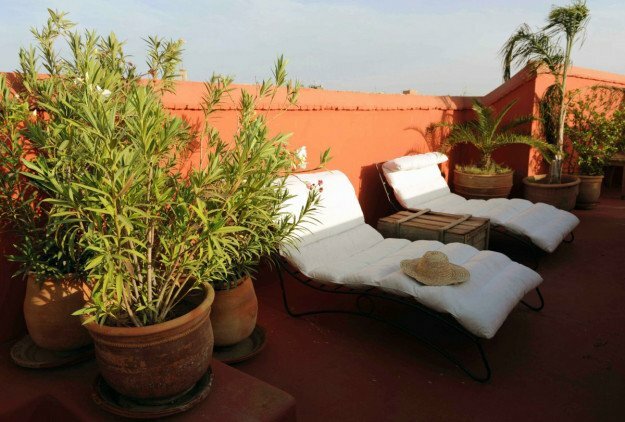 For a great roof terrace we'd suggest booking into either Riad El Fenn or Riad Kaiss. 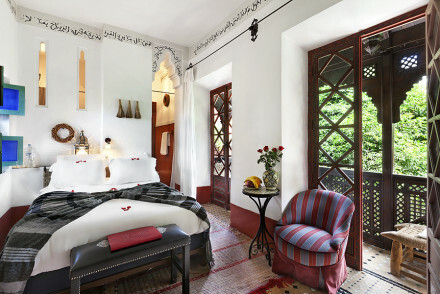 The last riad in our list, Dar Les Cigognes, is in one of the oldest parts of the Marrakech Medina, right opposite the Royal Palace and it's numerous nesting storks, providing a fabulous view across the Medina from a delightful rooftop garden of orange trees and bourgainvillea. 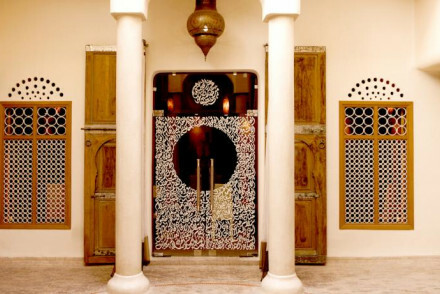 If you are on honeymoon, or if you simply want to splash out on a little more comfort, there are a handful of so-called luxury riads in the Marrakech medina. 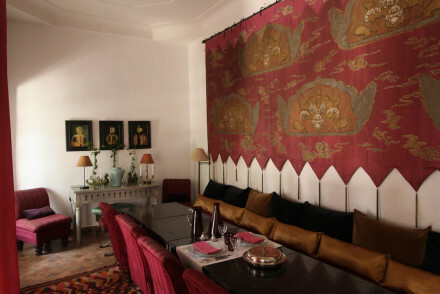 However, it's somewhat of an elastic concept in Marrakech, because the best riads have been lovingly restored by passionate and cultured owners with more or less luxury according to their personal style - and they come from from all nations. You can really tell, as these are not just places to stay for guests, but often homes too, and they provide a lifestyle for the owners that is hard to beat. I'm thinking here of Vanessa Branson and the Riad El Fenn, Meryanne Loum-Martin and the beautiful Jnane Tamsna (in the Palmerie), Herwig Bartels' Riad El Cadi (now run by his daughter Julia) or Eben Lenderking and his Sansouci Collection. So by all means consider the two more traditionally luxurious riads we recommend here - Maison MK and La Maison Arabe, but remember that some of our favourite riads don't have flat screen TVs - or indeed TVs at all! 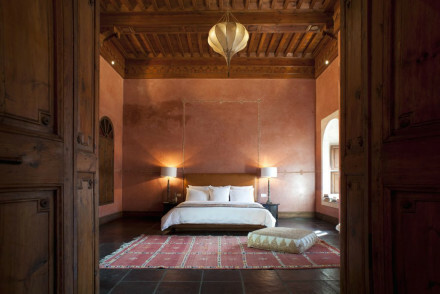 (PS - the Maison Arabe is right on the edge of the Marrakech Medina, but accessible by car). To see our complete list of riads and hotels, both in the Marrakech medina and outside, as well as some lovely country-house style hotels in the Palmerie, see our Best hotels in Marrakech list, as well as our Best Marrakech riads list.